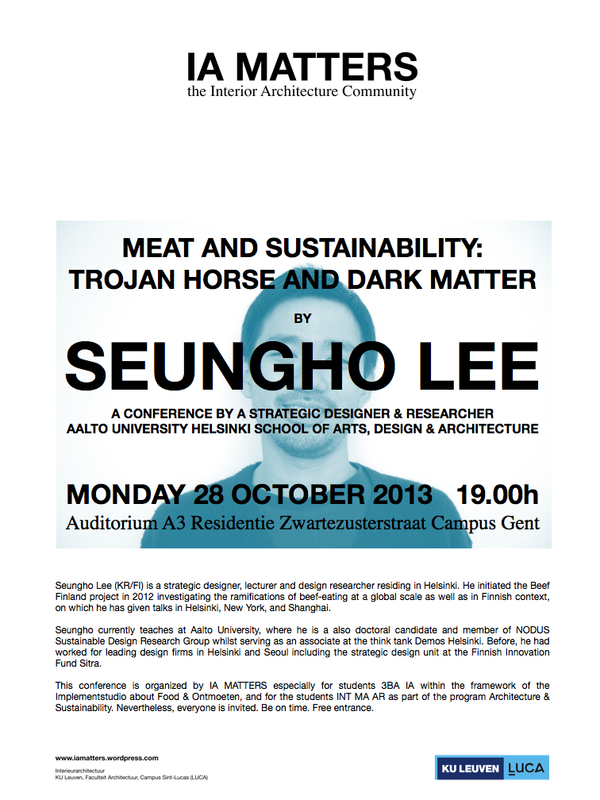 I was invited to give a talk at the Sint-Lucas Faculty of Architecture, KULeuven in Ghent, Belgium, on 28 October 2013. 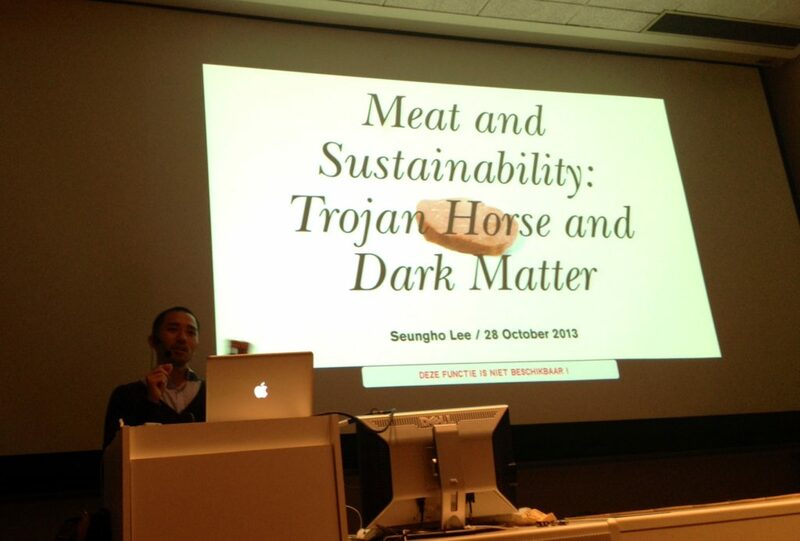 The title was “Meat and Sustainability: Trojan Horse and Dark Matter”, in which I have shared my look on strategic design and sustainability through the lens of beef production and consumption worldwide and in Finnish context. The content of the talk included problem framing in design, soft paternalism and systems thinking. The talk was opened by Koen Meersman who leads IA Matters, the Interior Architecture Community at Sint Lucas School of Architecture, and Kris Scheerlink, the program director of the master programmes at Sint Lucas School of Architecture, as it was a joint conference of those two programmes. Sint-Lucas is the oldest and the best architecture school in Belgium, and I was honoured to be there to share my experience. 세인트 루카스 건축학교(Sint-Lucas Faculty of Architecture, KULeuven) 측의 특강요청으로 벨기에 겐트에 다녀왔습니다. ‘고기와 지속가능성: 트로이목마와 마크매터’라는 제목으로 쇠고기 핀란드 2012 프로젝트를 소개하며 전략디자인과 시스템이론이 디자인과 지속가능성과 공공에 가지는 의의를 설명했습니다. 이 자리는 세인트 루카스 실내 디자인 커뮤니티인 IA Matters와 세인트 루카스 건축프로그램의 초대로 이루어졌으며, 특강은 IA Matter를 이끄는 쿤 미어스만(Koen Meersman)과 건축 석사과정 디렉터 크리스 쉬어링크(Kris Scheerlink)의 소개로 시작되었습니다. 세인트 루카스는 벨기에에서 가장 역사가 길고 명성이 높은 건축학교로 알려져 있습니다. Do you have an inquiry? Drop me a line.